Waking up at 2:30 am on the first day of the inaugural Epic5 Ultra Run Challenge, I was greeted by my ohana Lisa, who graciously offered me a cup of island coffee (as she also did six months earlier for Epic5 Ultra Tri Challenge!). It was time to get into high gear. This was it! For months leading up to this day, I created and tested menu items, packaging, and food temperatures. I researched local smoothie shops on Kauai, Oahu, Molokai, Maui and the Big Island. What was this Hawaiian foodie adventure all about? 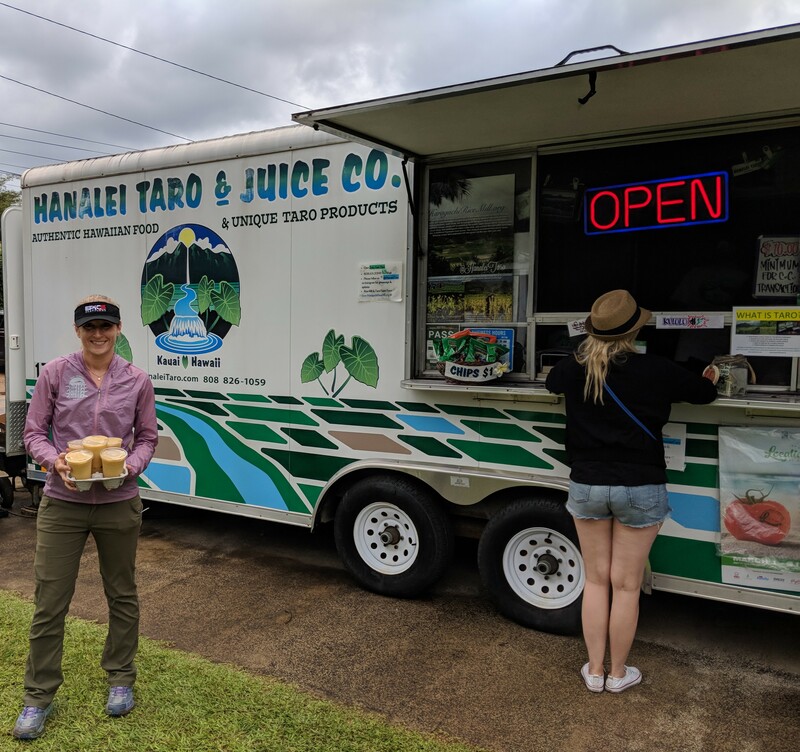 Fueling ultra-runners before they embarked on a challenging 50k course through 5 Hawaiian Islands in 5 days. Simple. Nutrient-dense. Adaptable. Steady Energy. Locally-sourced. These were my guiding food principles for menu offerings. Epic5 Challenge has a beautiful history with the Hawaiian islands, showcasing its beauty, with swimming, running, and biking courses that weave through the beautiful countryside and landscape. In keeping with this spirit, one of my priorities was to highlight local companies and people that embrace the beautiful Hawaiian culture. In my island-by-island report, you’ll find health-driven, kind-hearted, generous vendors. Perhaps you can visit them on your next trip to Hawaii! My role in this event was providing meals and beverages pre-event and smoothies post-event. As you can imagine, this created the challenge of navigating new kitchens and grocery stores. And a packed schedule of events required creativity, resourcefulness, and adaptability, which I embraced wholeheartedly. We flew on small planes and carried medium-sized duffle-bags, in which I packed a combination of my superfood powders, spices, and clothing. It was a unique and invigorating experience [fueled in part by delicious locally-sourced coffee!]. Kauai hosts the first 50k of the Ultra Run Challenge and runners began their quest aside Hanalei Pier. We began each day slightly before sunrise. Soon after the run started, the day began to lighten, the sun rising high above and I counted my blessings I could be a part of this unique event. Waikiki Beach often to comes to mind when US mainlanders think about Oahu, so given that the run course began in the North Shore, famous for big wave surfing and a slower pace, this exposed me to a whole different part of the island. Laid-back, rustic and beautiful. Those three words are just the beginning of the North Shore. Runners climbed up the gorgeous mountainside and finished their run through Kaena Point State Park, the westernmost tip of land on the island of Oahu. Keeping the smoothies cold until runner handoff was a challenge. They ended the run at a different spot where I was stationed. I also needed to get to the airport for car drop off. Somehow we would have to meet around the same time, tricky in an airport, in bustling Honolulu. Serendipitously, I was able to greet the runners and staff as they were unloading luggage at the airport drop. Happily, I gave them their icy-cold fruity smoothies. And we were off! Next, up Molokai, Maui and the Big Island! Stay tuned for Part 2 of my Hawaiian Foodie Adventure!